Find real estate for sale in Glendora and surrounding areas by selecting from our results below, or by entering your search criteria. Glendora is a larger medium-sized city located in the state of California. With a population of 51,851 people and 13 constituent neighborhoods, Glendora is the 172nd largest community in California. Housing costs in Glendora are among some of the highest in the nation, although real estate prices here don’t compare to real estate prices in the most expensive communities in California. Unlike some cities, Glendora isn’t mainly white- or blue-collar. Instead, the most prevalent occupations for people in Glendora are a mix of both white- and blue-collar jobs. Overall, Glendora is a city of sales and office workers, professionals, and managers. There are especially a lot of people living in Glendora who work in office and administrative support (14.80%), management occupations (12.33%), and sales jobs (11.08%). Also of interest is that Glendora has more people living here who work in computers and math than 95% of the places in the US. One downside of living in Glendora is that it can take a long time to commute to work. In Glendora, the average commute to work is 32.03 minutes, which is quite a bit higher than the national average. On the other hand, local public transit is widely used in the city, so leaving the car at home and taking transit is often a viable alternative. 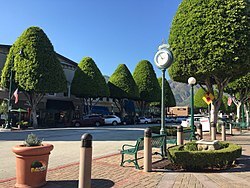 Although the majority of commuting trips in the city are by private automobile, Glendora is somewhat unusual for a city of its size for having a substantial number of people who use public transportation. For a lot of people, the bus helps to get to and from their jobs every morning, which benefits everyone in the Glendora area by reducing both traffic and air pollution. In terms of college education, Glendora is substantially better educated than the typical community in the nation, which has 21.84% of the adults holding a bachelor’s degree or graduate degree: 33.20% of adults in Glendora have a college degree. The per capita income in Glendora in 2010 was $33,967, which is upper middle income relative to California, and wealthy relative to the rest of the US. This equates to an annual income of $135,868 for a family of four. However, Glendora contains both very wealthy and poor people as well. Glendora is an extremely ethnically-diverse city. The people who call Glendora home describe themselves as belonging to a variety of racial and ethnic groups. The greatest number of Glendora residents report their race to be White, followed by Asian. Glendora also has a sizeable Hispanic population (people of Hispanic origin can be of any race). People of Hispanic or Latino origin account for 30.88% of the city’s residents. Important ancestries of people in Glendora include Irish, English, Italian, and French . Glendora also has a high percentage of its population that was born in another country: 17.47%. The most common language spoken in Glendora is English. Other important languages spoken here include Spanish and Arabic.